McKAL drive is a car cigarette adapter with USB ports for iPad/iPad2 or GALAXY Tab. drive is designed to deliver up to 2.1A for charging an iPad, iPad2, GALAXY Tab or other tablets - one at a time. 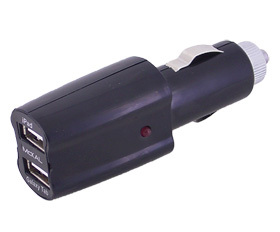 drive is compatible and can be used with all automobile car cigarette lighter sockets. With a maximum output of 5V 2.1A, drive matches the performance of the original chargers. drive keeps your dashboard neat and tidy while delivering uncompromising power that is required by your tablet for full and fast charging. Use it together with McKAL smart retractable cable for iPad2 and GALAXY Tab for ultimate experience in mobility charging.